although fashion and beauty may not be the focus of my blog, i know that they’ve been the topics of conversation a little bit lately. today’s post is no different, as i just have to tell you all about the new face care regimen i’ve got going. several weeks back, sarah was in town for nrw at thai bua in town brookhaven, and after scarfing down platefuls of delicious sushi and pad thai, she joined me across the street at publix to pick up a few groceries. i was in desperate need of facewash, so we headed to the skincare aisle. i asked her if she had any recommendations, as i always tend to just go with something cheaper and store-brand. 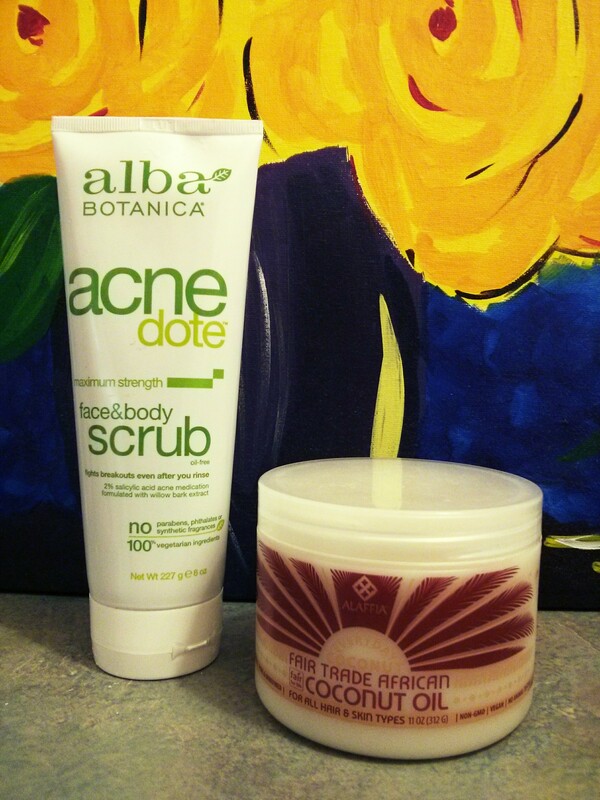 she immediately replied “yes” and helped me find the acnedote face & body scrub by alba botanica. she uses it on her face and body in the shower, so after making my purchase, i did the same. i was startled when i plopped that first dollop out on my hand – this stuff is grainy and brown! it threw me for a second, but then i rubbed it in my hands, washed my face, rinsed off, and patted dry. after a month’s worth of time, i can give it the same rave review sarah has. there’s no harsh chemical smell in this product even though it has the maximum strength 2% salicylic acid for a deep clean. the ground walnut shell isn’t scratchy and doesn’t feel like you’re scraping off that first layer of sensitive facial skin. it’s light and gentle enough that you can use it daily, just like me! i liked it so much on my face that i started using it with my loofa while showering also. i’m not sure how much of the effect is placebo, but i have received compliments on smoother skin. how about that! part of the credit for this healthier glow must also go to the alaffia fair trade african coconut oil my previous stylist karen suggested for me. as she was trimming my bangs one day at the salon, i mentioned that i wanted to start using a moisturizer but didn’t really know where to start. anything oily or thick was out of the question. i didn’t need anything scented, just something that would get the job done. without hesitation she recommended coconut oil. “coconut oil?” i asked with a bit of curiosity. i think i was confused because when i hear oil, i picture something a bit more liquidy, not necessarily something i’d use as a lotion, per say. she assured me it would work wonders, so i took her advice and ran with it. you can find this particular alaffia brand of coconut oil at whole foods, which is where i got mine. for about nine bucks, you get a huge tub of the stuff, and i promise it is going to last you a while. the texture is almost crisco-y, but i hesitate to say that because the thought of applying crisco directly to my face makes me want to be ill. anyway, it’s kind of got that texture. all you need to do is kind of scrape some out of there, place it in the palm of one hand, and then use the fingers from your other hand to kind of rub it around and melt it. it’ll become more liquidy and you can then apply it to your face. a little goes a long way here, so start out with a smaller portion; there is plenty in that jar if you need more. this coconut oil isn’t heavy, but it does take a little bit to soak into the skin. i usually only use it at night, but if i want to use it in the morning, i make sure i put it on about an hour before i apply any makeup, just to be safe. do i have a completely clear face these days? not necessarily. after all, i am a woman in her mid-20s, so there’s all sorts of hormones flying around. however, i am seeing a more even skin tone overall, and i certainly can testify that my skin feels softer. if you’re looking to give a new product a try, might a suggest either of these? 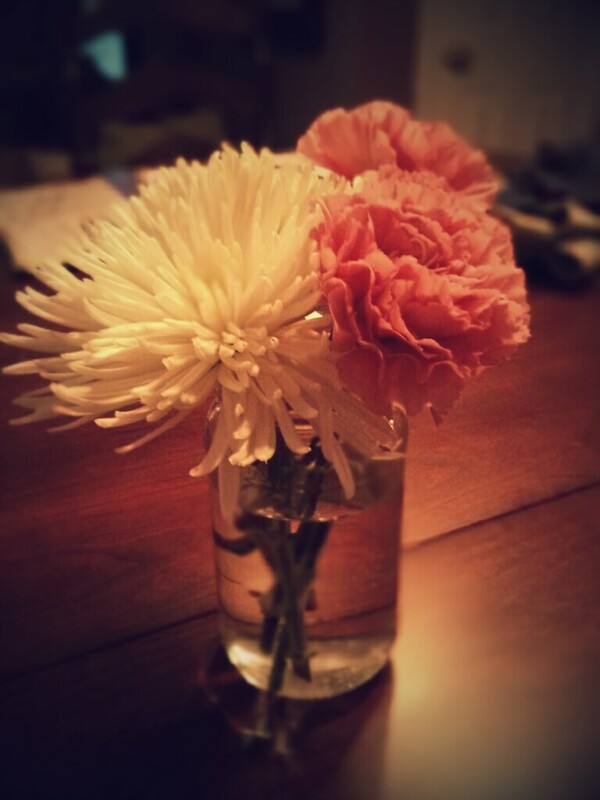 oh, and because you’re such a sweet and loyal reader, here are some flowers. they were a gift from phillip, but i don’t think he’ll mind if i share them with you all. Kelsey, I’ve been using organic coconut oil on my skin for over a year. I put it on while still in the shower (after cleaning up but while skin is still wet). Then towel dry off. I really like the way my skin is smooth all day long. It does absorb better on wet skin than on dry skin. Ooh, good thinking! I’ll definitely give it a try.